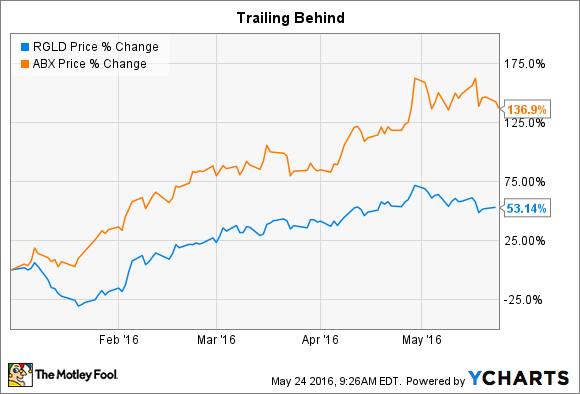 3 Beaten-up Cheap Stocks: Are They Bargains? This trio of stocks have taken their lumps; does that make them good buys right now? If you're like me, you're always on the lookout for a bargain. A stock that's been beaten up for some reason and is now cheap. The problem is figuring out if the low price is a contrarian opportunity or a risky gamble. Right now, it seems like Royal Dutch Shell (NYSE:RDS-B), Alliance Resource Partners (NASDAQ:ARLP), and Royal Gold (NASDAQ:RGLD) are all worth looking at...but are they all bargains? Royal Dutch Shell is an integrated oil giant that ranks up there with peers like ExxonMobil (NYSE:XOM) in scale, longevity, and diversification. However, Shell's yield is 7.6%, and Exxon's yield is a far more meager 3.3%. Shell looks cheap in other ways, too. For example, its price to book value ratio is hovering around 1, while Exxon's is about 2.2. So, yes, Shell looks cheap. But is it an investment opportunity? That depends. First off, the company just completed a big merger that will augment two of its production focuses: liquefied natural gas (LNG) and offshore oil & gas. This was an expensive bet during an industry downturn that could strain the company's finances. Some are suggesting a dividend cut could be in the cards, but so far, Shell's management has stood by the distribution. And natural gas increasingly looks like a key fuel for the future, helping the transition from carbon-based fuels to "clean" ones. In the end, Shell is almost certain to survive the current oil downturn. 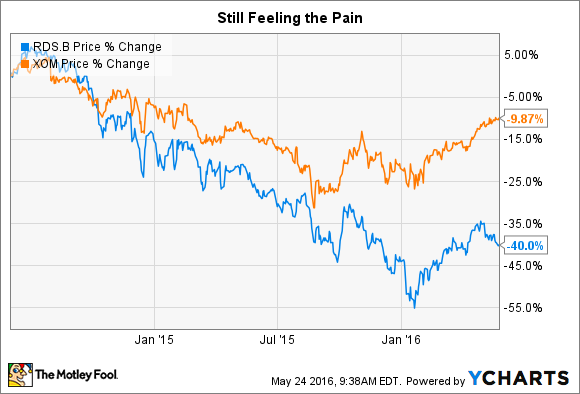 And it looks like it's positioning itself well for the future, even if that means some near-term pain. If you are comfortable with a contrarian bet, Shell looks like it's cheap today. That said, if you're an income investor, you might want to tread carefully, as the dividend piece of the story is less certain. Alliance Resource Partners is a major thermal coal producer in the United States. It operates primarily out of the Illinois Coal Basin (ILB). Even though coal has been out of favor for years, Alliance had been able to expand production and grow its top line because ILB coal was taking share from coal produced in other regions of the country. That all changed late last year. This coal miner has now joined the chorus of other miners that have been pulling back production and focusing on cutting costs. Alliance even trimmed its distribution earlier this year after over a decade of annual increases. And if you look around the coal industry today, you'll see it's littered with bankruptcies because utilities have been switching to cleaner fuel options. So, Alliance is operating in a really tough sector, and there's a good reason for its units being beaten down. In fact, even after the distribution cut, it still yields over 10%. There are a lot of reasons to run for the hills, here, but is there any reason to give Alliance a second chance? The answer is a resounding yes. The first quarter was tough, but even during the darkest of days, Alliance's net income was $0.36 a share. In other words, while peers are bleeding red ink and seeking bankruptcy protection, Alliance is still making money. It expects to cover its new, lower distribution by 1.6 times this year. That's pretty robust coverage, and it shows that management is taking a conservative approach to its finances. In fact, the dividend cut was more about ensuring access to the capital markets and appeasing skittish banks than an actual need to save cash since the business is operating on plan (in other words, the partnership's operating performance wasn't the issue). Alliance isn't for investors with weak stomachs, but it is holding up better than peers. Also, while this may not be politically correct, coal is likely going to remain an important energy source for many years yet. With desirable coal and a profitable business, Alliance could be a bargain for aggressive investors willing to bet against the crowd. A buy after a 50% run? Next up is Royal Gold, a precious metals streaming company. It's a tougher story to sell since so far this year, shares are up roughly 50%. That said, they are still down around 40% from their 2012 highs. And that year-to-date gain is nothing compared to some mining-focused competitors, like Barrick Gold, which is up more than 100%. Compared to that, Royal Gold looks like a laggard! But, really, is Royal Gold a bargain, here? The answer is (as usual), it depends. Precious metals stocks took it on the chin, but Royal Gold is a different variant on the theme. While miners were forced to trim production, cut costs, and sell assets, Royal Gold was busy inking streaming deals with the troubled miners -- providing them much-needed cash in exchange for the right to buy silver and gold at reduced prices in the future (Royal Gold funded those deals by selling stock, which the miners effectively couldn't do). Buying precious metals streams grows Royal Gold's business and means it will exit this downturn with a stronger profile, and more production, than when it went in. That's not what's happening at most miners. But here's an extra kicker: Royal Gold has increased its dividend for 15 consecutive years. That includes right through the recent precious metals downturn that's led so many miners to cut their payouts. So, if you're looking for a precious metals company to add to your portfolio, Royal Gold is still down from its recent highs despite the year-to-date gain and has a dividend history the miners can only look at with envy. For the right investor, Royal Gold does, indeed, look like a beaten-down bargain today. So much about investing depends on how you look at things. Shell, Alliance, and Royal Gold all have very appealing features if you're willing to look beyond the obvious negatives and don't mind taking on a little more risk (that's particularly true in the case of Shell and Alliance). But don't count any of these names out just because they look like laggards. In fact, that's exactly why they are each so appealing.